Not One Or Two, But 3 New, Smoking Hot Info Products - All Targeted At Hungry Niches - Complete With *No Restriction* Private Label Rights! 51 Pages, No Restriction PLR! Target Market/Demand: Entrepreneurs who wish to build a solid income from the comfort of their own homes. Product Description: Home businesses are the new 'IN' thing when it comes to being an entrepreneur. It entices people with their low startup costs and making money in their pajamas lifestyle. 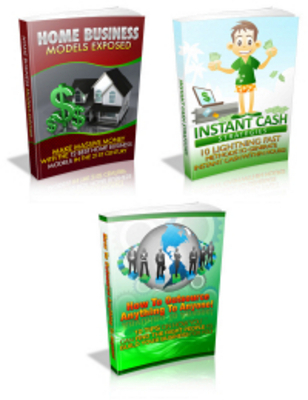 You will learn 3 of the best home business models available today! Target Market/Demand: Anyone who wishes to make fast cash. Even works for people who hate Internet marketing. Product Description: With the many different established markets out there, money will always be there for the taking. The question is whether it will go into your pocket or not. In this book, you will learn the simple art of making quick cash even if you are brand spanking new in Internet marketing! Target Market/Demand: Entrepreneurs who are short of time or are looking for the best ways to leverage on other people. Product Description: Gone are the days of the 'one-man show'. If you really want to get things done, you must leverage on a team of people. This book will teach you how to find all the best people to build your business and your profits for you! Priceless Bonus:	A Replica of This Letter with Thank You Page!